WORDS. Spoken BE AU TI FULL Y by the lovely Katherine Matthews of Purl Diving. I cannot recommend this podcast highly enough. Even if you are not a knitter, get thee to it, her quirky musical taste and soothing voice will enchant you. This week I am working a little more than I normally do, we are were behind on a project and my boss is away. This means I am spending three hours a night, after the bunnies go to sleep, doing data entry. I resurrected my nearly dead iPod for the occasion. I was quite pleased to discover a few new knitting podcasts when I downloaded the latest version of iTunes. I instantly fell in love with Purl Diving. Only this evening, when I delved further into the web site, did I discover that Katherine Matthews is also the author of Wabi Sabi. Hands down one of my favorite knitblogs (I guess it goes without saying that if I like her written words I would like her spoken words…but podcasting is a tricky thing… it’s more than the sum of the parts if you know what I mean). I’ve lurked at her site for more than 3 years. Do go give her a listen and a read, you won’t be disappointed. Yes I am still alive. Our house seems to be rid (finally) of that evil, evil sick. Both my husband and I are on the tail end of massive work projects. And so I return to you. In exchange for your patience during my absence I offer a delicious knitted treat. 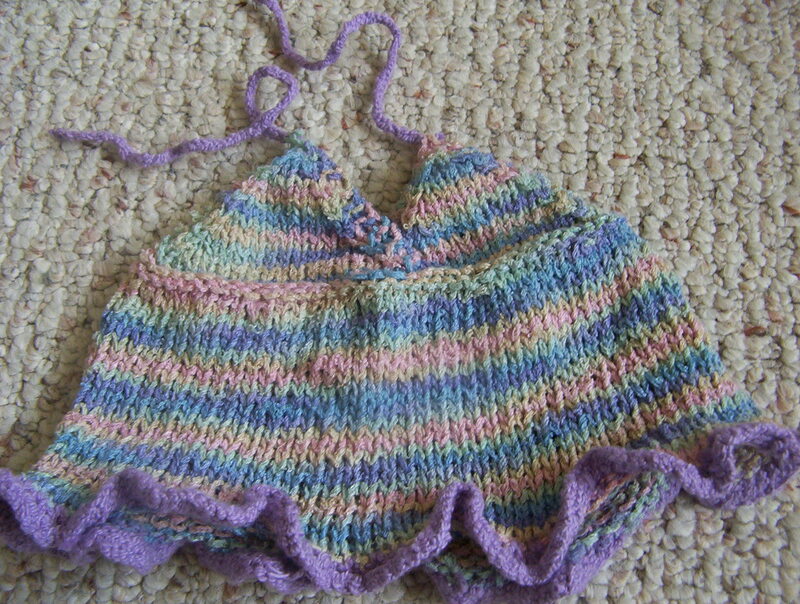 This sweet, little, hand spun silk-cotton, baby halter (a modified version of this) was knit a while ago (maybe even pre-blog) but is now on it’s way to a beautiful baby girl in Austin, TX. Happy Birthday Miss Tully! Now that we’re in good health and out of the work-hole, I’m running again (I think I’ll just baaareeelly make my 100 miles by the end of the month), knitting up a storm, clicking on knitty every 10 seconds to see if the spring issue is out, and revising my stash smash list (more on that in the next post). Ahhh it feels good to be back to a manageable level of crazy. You are currently browsing the Bunny Slippers blog archives for March, 2007.